Walking with Jesus: Day 66: Acts 19:11-20 & Prov. 22:22-29 - What are the Dangers of Faking It? Day 66: Acts 19:11-20 & Prov. 22:22-29 - What are the Dangers of Faking It? What are the Dangers of Faking It? 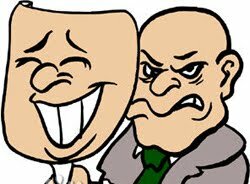 Anyone who has been a Christian for a long time, and especially anyone who has been in ministry for a while, has experienced the sad reality of faking it. You aren't really walking closely with the Lord, but you put on a smile and say the right words and do the next thing. You're dried up inside and questioning your faith, but you feel obligated to keep up appearances and so you do. Everyone thinks you're a wonderful Christian, so mature in the Lord, and inside you feel like a fraud. It's often been said that the Christian life has seasons, and sometimes this can be one of them. Sadly, what begins as a season can become a way of life, and what was once a season of dryness and longing can become callousness and hypocrisy. Pastors who commit adultery or otherwise disqualify themselves from ministry often testify that they had been faking it for a long time before they fell. All too often, it's also the case that many people can fake their Christian testimony and say the right words to fit in, while their hearts are unchanged by God's grace. The sons of Sceva found out the dangers of using the right words without having a changed heart. Paul's successful ministry in Ephesus had led to great attention and interest from unexpected corners of the city. A group of Jewish exorcists saw the work God was doing through the Apostle Paul in the name of Jesus and they decided they would try to get in on the action. They used the name of Jesus and referenced Paul when they did their exorcisms. But trying to do the work of God on our own and not in the strength and power of God is a recipe for disaster. The seven sons of Sceva "fled out of that house naked and wounded." We need sincere faith, not an empty profession. We need the Holy Spirit dwelling in us, not the right kind of Christian talk merely on our lips. We need time in the word and in prayer, time in fellowship and worship, and the courage to be honest with God and with one another. We do not need to fake it. The costs and consequences can be too high. Heavenly Father, Thank You for Your love and for Your saving power. Thank You that You are with Your children always, through the Holy Spirit who dwells in us. Give us Your strength, that we might walk and serve in You and not in ourselves. In Jesus' name, Amen. Heavenly Father, You care about issues of justice and righteousness, and You call us to follow You in treating the poor with equity and respect and in walking with integrity in all areas of our lives. Father, give us the character of Christ, by the power of Your Spirit, that we might love others, deal honestly, work diligently and praise You for all of Your goodness through it all. In Jesus name, Amen.